Your feedback was awesome last week. I really, really appreciate it! Please, keep it coming! 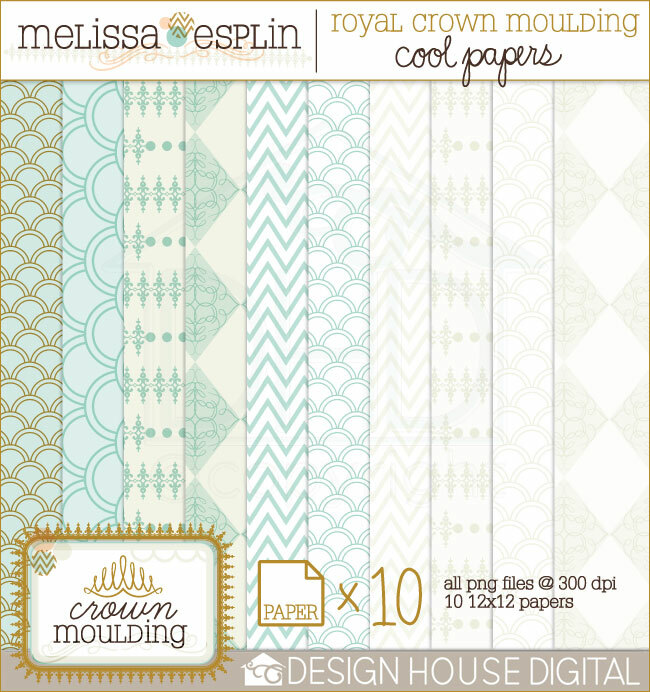 I listened, and this week I’ve released my newest collection: Crown Moulding. I’m really proud of it. I’ve been looking forward to today for a while, I’ve been that excited about it. 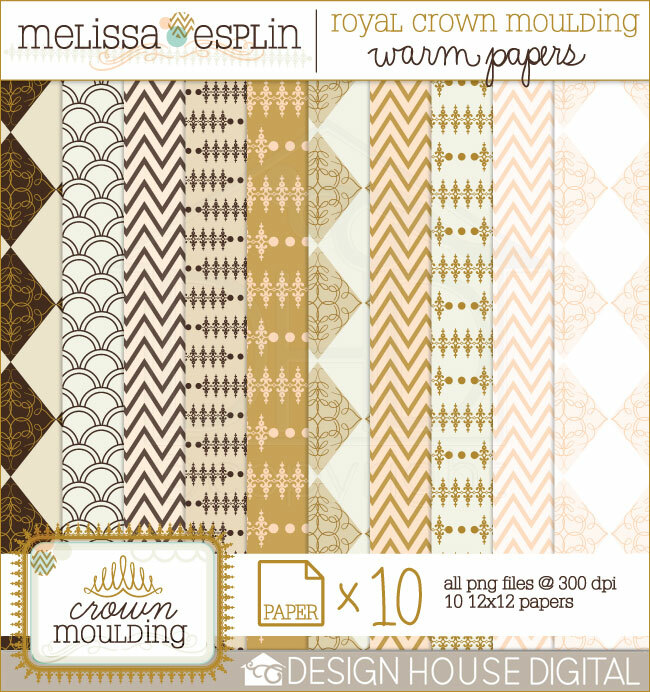 Crown Moulding’s color pallette was inspired by 100 Layer Cake’s holiday glam colorboard. Isn’t that a gorgeous colorboard? Yummy. Have I mentioned how much I enjoy making repeat patterns? It’s been a little obsession of mine for a while now. I surely couldn’t go without making a couple of pattern sets with this collection available in warm & cool colors. Here’s a border set. Doesn’t it look regal? Again, making repeat patterns and borders is so much fun. It’s like I get endorphins out of it or something. Your feedback was really positive about the blog graphics, so here you go! A blog kit just for you. Go buy it (only $6.99 today! ), use the graphics on your blog and make all of your friends jealous. Are you going to have any parties soon? 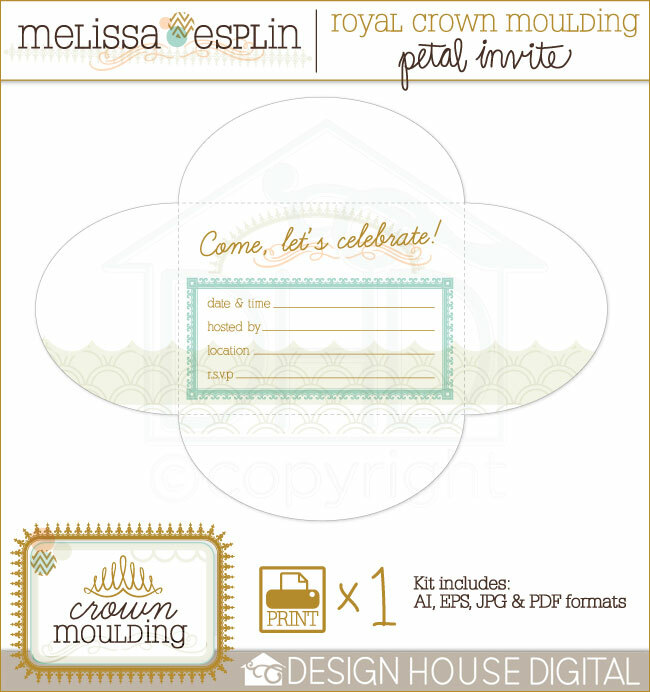 Check out this invitation printable! I just wish that I had a baby or bridal shower to plan. Getting married? 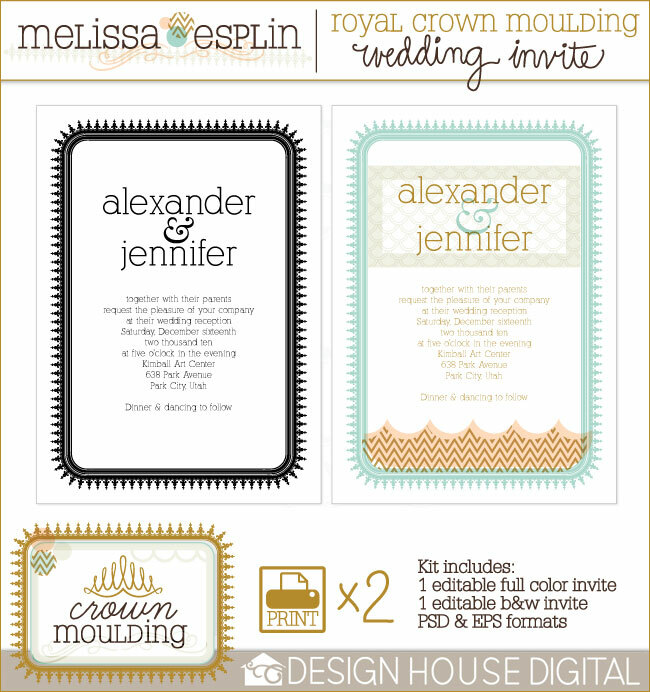 Get glam invitations on a budget! Kit includes 2 5×7 designs (fits in A7 envelopes) in 2 editable formats, .eps & .psd. Whether or not you’re into Digital Scrapbooking, I hope there’s something there for you to try! Head over to DHD today and get 30% off all my new releases! Enjoy. Oh Melissa! this is beautiful! Love it. love it. i bought your new blog kit, but i’m too dumb to figure out how it goes on my blog. wahhhh. WOW- Melissa this is BEAUTIFUL! Haven’t seen ANY other digital scrapbook stuff like it. I love your perspective and the graphic nature of your designs. It’s gorgeous. Going to add it all to my shopping cart RIGHT THIS MINUTE. So awesome! No wonder you were excited, these are beautiful. oh Melissa, this is your best yet! it is so so beautiful! I love it so much I want to buy it but I am not a scrapbooker. what else can I use this for other than digital scrapbooking? please give me a reason to buy it!! oooh. i love every bit of it. from the wallpapery scallops to the crown itself. beautiful. two things…first, these are really stunning. gorgeous patterns and colors. but it reminded me something that i’ve been meaning to tell you. remember how i used your birthday invite for maren’s party? some of them got returned to me marked as “too small to ship.” i thought it was weird that not all of them got returned, but i figured i’d pass it on. it’s too bad because they’re so adorable and tiny when they’re all folded up! I spotted those patterns in the shop when you released and just squealed out loud — they are GORGEOUS!!! 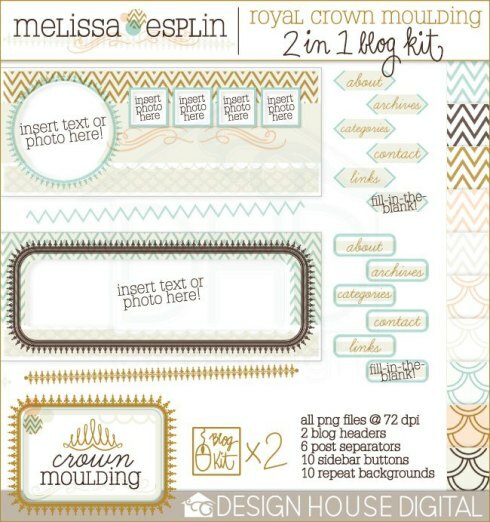 I love the blog kit, love love love it! and thanks so much for posting a link to the mood board. A friend sent me some images once from there and I misplaced the link — so nice to come across it again on your site! Thanks for letting me know! I think I made this petal invitation a little bit larger than the Penelope invite. That’s truly weird that some of them were deemed too small, but not all of them. I’m pretty sure that envelopes as small as business card size can go through the mail. I guess it’s time for a trip to the post office to find out! Hi Melissa! Thank you for telling me about the DEO warehouse in SLC. Is it open to the public? If so, I would definately go and check it out! You have such a nice blog here. I am so glad that you came to visit me! YES! It is open to the public. That’s what makes it so fabulous.